Next to this sign, long heralding the development of a new park to serve the Hazelwood, Woodland Hills, and Parkrose Heights neighborhoods of outer East Portland, groundbreaking for the new Gateway Discovery Park is underway. At long last, a planned new park is under construction in the Gateway area, at the site of what once was a bowling alley and JJ North’s Chuckwagon Restaurant – at NE 106th Avenue along Halsey Street. 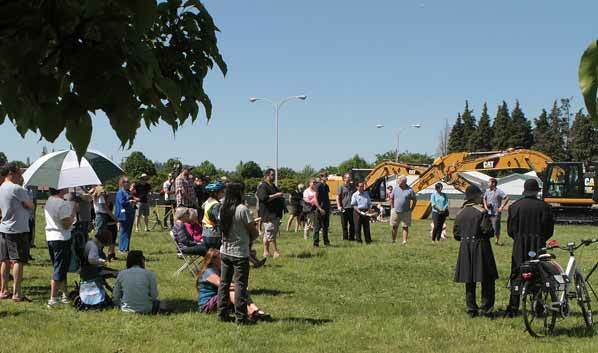 “Getting to this point has been a long process,” remarked Hazelwood Neighborhood Association Chair Arlene Kimura, at the May 7 groundbreaking ceremony. With the heavy construction machinery already on the acerage as the backdrop, a throng of neighbors and officials gather to break ground for the new park. 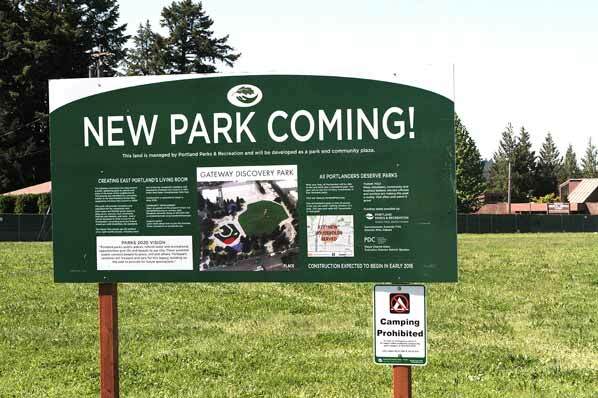 “Called Gateway Discovery Park, the nearly four-acre park will become a ‘family room’ for the Gateway community,” smiled Portland Parks & Recreation Director Michael Abbaté. “This is going to be a phenomenal new public place,” Abbaté went on. 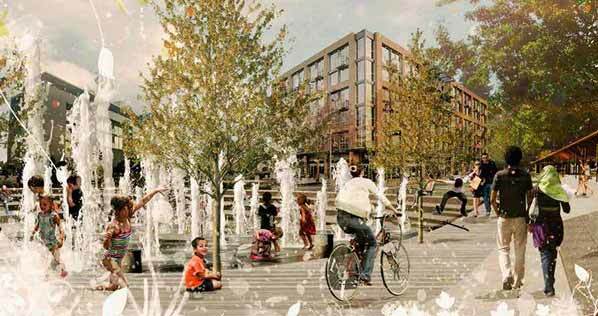 “It’s more than a neighborhood park – it also will feature a plaza for community gatherings, events, activities, and celebrations, for all of outer East Portland. “As envisioned in the Master Plan, the park will also include flexible green spaces to accommodate picnic areas, accessible playground features, and a nature play area,” Abbaté said. 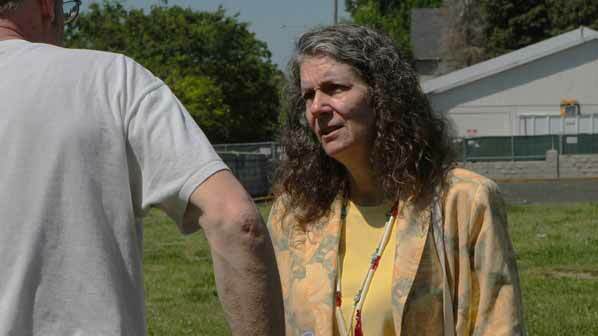 Speaking with a neighbor, Portland City Commissioner Amanda Fritz says she’s excited about the new park. Portland City Commissioner Amanda Fritz said she was “very excited” that work is moving forward on the park. This park will have facilities for those of “all abilities”, says Harper’s Playground Executive Director G Cody QJ Goldberg. During the remarks, Harper’s Playground Executive Director G Cody QJ Goldberg said the Gateway Discovery Park will be the site of Portland’s second inclusive, barrier-free playground. The park will add “a touch of heaven” to the community said longtime Gateway area booster Fred Sanchez of Realty Brokers. Sanchez gave a “pop quiz” regarding the history of the area, and this property in particular. Quiz winners were awarded a rubber chicken keychain by members of the Gateway Keystone Kops. 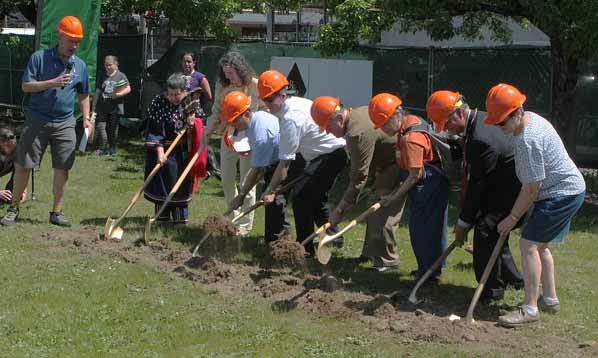 Neighbors, business leaders, and officials dig in to break ground for Gateway Discovery Park. Portland Development Commission Executive Director Patrick Quinton [who left the position on June 8] enthused about the park and development of the parcel. “We’re happy to work with the Parks Bureau to make this happen. We believe this park can have a significant impact to what’s going on in the Halsey/Weidler area. 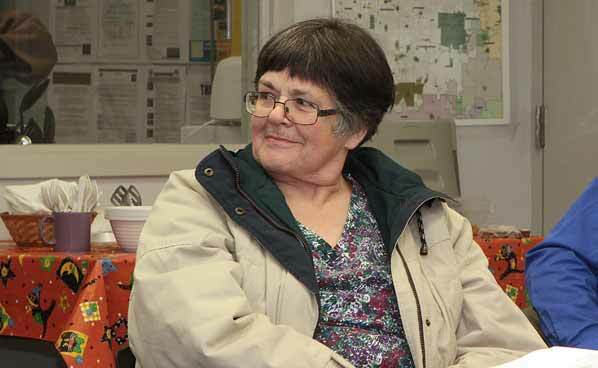 Seen here at an East Portland Parks Coalition meeting, Linda Robinson says neighbors are concerned that the PDC building will consist of affordable housing, and new offices for nonprofit Human Solutions – instead of high-quality retail space. Longtime Portland Parks advocate, and Hazelwood neighbor Linda Robinson later said she was glad the park’s design stayed intact – but questioned the PDC’s building affordable housing on their part of the site. “Neighbors are not opposed to affordable housing in the Gateway Urban Renewal Area,” commented Robinson. “However, the project, as proposed, is the wrong project for this site. 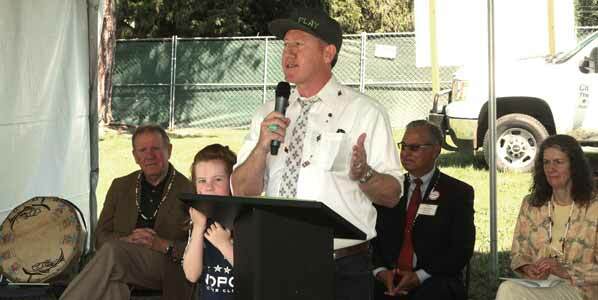 “Here’s why: the proposed project is not consistent with the plan the community agreed to in 2009; it’s not the quality ‘catalytic’ project promised by PDC; and it won’t generate the TIFF revenue PDC said it needed to have in order to cover the cost of purchasing the park property,” explained Robinson. “In addition, there was absolutely no public engagement in the process, not even any notification, when they decided affordable housing should be built there,” Robinson added.